After all the crazy upsets the first week of Wimbledon, here we still end up with the predicted (by many) final, for the men anyway. The fans of Roger Federer still were adjusting to him not being at least in the quarterfinal, and couldn't help but wonder what the outcome would have been if he had been in the semi, but that's irrelevant at this point. 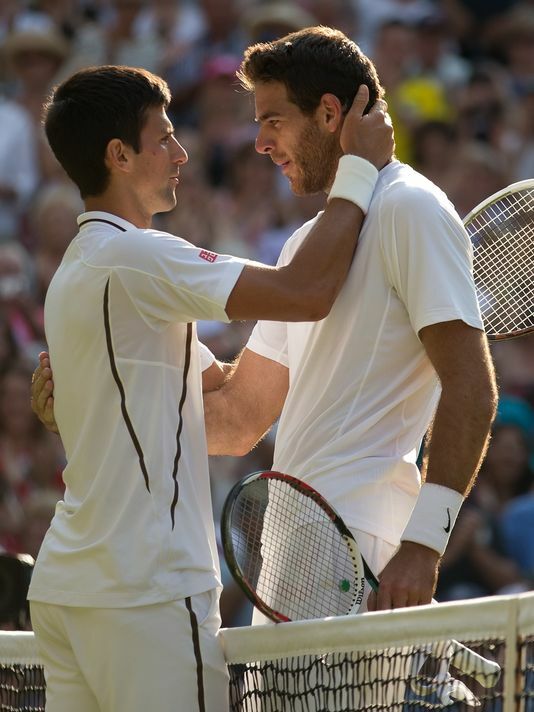 The fact is that it is again Novak Djokovic and Andy Murray facing off on Sunday. The second men's semifinal wasn't the same high level of tennis as the first one, but it still had its drama. For some reason I was expecting this to be a fairly easy win for Andy Murray. Jerzy Janowicz had other ideas, however. After splitting the first two sets I was pretty surprised when Andy gave up a break in the third, thinking once he had found his game he would cruise. But all of a sudden things turned around again. I think Janowicz's drop shots were starting to really irritate Murray, and when Jerzy acted rather unsportsman-like by hitting the net with his racquet after a missed shot, with boos from the crowd, I think it triggered something in Andy, causing an amazing round of aggressive play getting the break back and also another break, finally closing out the third set. There was no coming back after that, in spite of the delay for the roof to be closed (much to Andy's frustration) and he closed out a quick final set at 6-3 to seal the deal. I really don't know who is the favorite between Murray and Djokovic. Personally I would like to see Andy get his win at home after last year's heartbreak. As for the women, the first semifinal ended up being a blow out match for Bartoli to reach the final, followed by a see-saw match in the next one which Lisicki finally took. Either way we will have a first time grand slam champion. In spite of the fact that Marion Bartoli can about drive you crazy with her quirkiness on the court, when you actually listen to her in interviews she can be rather endearing. And of course who can't love Sabine Lisicki's contagious smile, plus the fact that one of the giant killers finally came good and actually followed up their big win. What a Cinderella story that would be for her to end up holding the trophy in the end. So even though Wimbledon was full of surprises and disappointments the first week, we still have ended up with some compelling tennis and some good stories. I am looking forward to a weekend with some very good matches that really could go either way. And even the men's doubles final has some excitement to see if the amazing Bryan Brothers can hold all four grand slam titles simultaneously. Should be an exciting next couple days.